Whole-health dentistry is essential to the wellbeing of adult patients. It is invaluable to the oral and overall development of children. Yet some biological practices serve adults only. In the Richmond, VA area, parents have access to healthy holistic dentistry for their children, too. Dr. Olivia Hart welcomes patients of all ages. Once it was a common belief that there was no real need for dental care until a child’s secondary teeth came in. Fortunately, today’s parents are much more astute, taking prompt initiative to find a dentist for kids. Every child is unique, so whether you have one or several, you are likely to have dental concerns. Early dental visits are ideal opportunities to ask questions about thumb-sucking, pacifiers, baby bottle tooth decay, and more. Most kids get cavities. Your child does not have to be one of them. Dr. Hart educates parents and young patients on nutrition, oral hygiene, and preventive care for cavity-free smiles. If your child ever does need a restoration, at Richmond Family Dentistry, you can feel good about fillings that are metal-free, contain no mercury, and are BPA-safe. A family dentist attuned to young patients pays close attention to oral development. Dr. Hart is vigilant for signs of delayed eruption of teeth, small dental arches, crooked teeth, grinding and clenching, or other indications of potential problems. She may recommend interceptive orthodontics to avoid bigger problems later. Countless children have symptoms of sleep apnea and other airway issues misdiagnosed. Many end up on habit-forming medications for behavior modification. Dr. Hart has advanced training in diagnosis and treatment of children’s airway health issues. 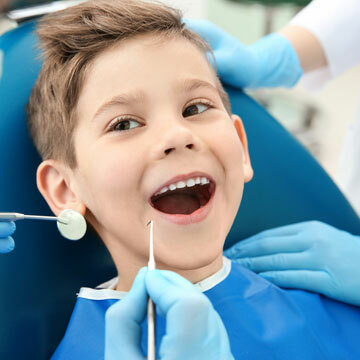 As a biological dentist, Dr. Hart is committed to seeking out the safest possible dental materials and techniques to keep little mouths and bodies healthy. Contact Dr. Olivia Hart of Richmond Family Dentistry to make sure your little one receives holistic dental treatment. Click here to make an appointment now or call (804) 381-6238 to learn more.